Over 20 laser eye surgery-related suicides reported and many more suspected. Countless more are suicidal, blind, visually disabled, or in incapacitating pain. Tens of thousands in the U.S. alone with post-LASIK corneal ectasia. LASIK surgeons hope the public never finds out. What about the misleading 95-96% patient satisfaction claim? Read here to see what they're hiding. Suicidal LASIK patient with eye pain, Lasik warning for Spain, LASIK warning for France, LASIK warning for the Netherlands, ReLEx SMILE risks, corneal collagen crosslinking and new case report. Thank you for visiting this website. Over 50,000 individuals visit this site every month seeking factual information about the risks of LASIK. This site is operated by private citizens and receives no corporate or industry support whatsoever. In other words, we have no financial interest in your decision to have LASIK or not. Our mission is to warn people about LASIK risks, side effects and complications prior to surgery. LASIK patients experiencing problems should seek the advice of a physician. Sign the petition to withdraw FDA approval of LASIK lasers. In memory of Max Cronin. Can you go blind from Lasik? Read the facts and then decide... ls LASIK safe? Learn about Visualase Laser Eye Surgery clinic, Bolton, UK; take the Wavelight Allegretto Wave Challenge. In response to readers' questions about LASIK alternatives, information on implantable lenses. If you're considering LASIK, you've probably heard a lot about the supposed benefits of the surgery. But what about the risks and long-term consequences? Don't rely solely on a LASIK sales pitch for the facts. Before you risk your eyesight, read Top Ten Reasons Not to Have LASIK Surgery. Our advice: Keep your glasses!!! 10/3/2013 - Watch Dr. Oz's LASIK surgery undercover investigation. Read accompanying article on Dr. Oz site. Considering LASIK? Advice for patients from Dr. Oz. If you experienced chronic dry eyes, persistent night vision problems, or other problems from LASIK, the FDA wants to know. When there is LASIK industry money involved, you can be sure that risks and complications are downplayed or hidden. There are individuals and organizations on the Internet, funded by LASIK surgeons, posing as "LASIK patient advocates", "LASIK experts", or LASIK education sites. Don't be fooled by these LASIK marketing scams. Any organization that refers patients to LASIK surgeons, provides a list of LASIK surgeons, or receives money from the LASIK industry is not looking out for the best interest of patients. Information on LASIK surgeon referral sites is biased and unreliable. LASIK is an unnecessary surgical procedure that carries risk to the organ through which we get 80% of our information. LASIK surgeons routinely fail to inform prospective patients about adverse effects and long-term consequences of LASIK. LASIK-induced vision loss cannot be corrected by glasses. Nearsighted patients who decline to have LASIK retain the ability to read and see up close after the age of 40 by simply removing their glasses. LASIK is NOT medicine -- it's big business. Caveat emptor -- Let the buyer beware! Click here to watch entire segment. FDA clinical trials found a ~20% complication rate six months after LASIK, including newer technology. See chart of FDA data. Several thousand LASIK-injuries have been reported to the FDA. Read a sample. File your complaint. Dr. Perry Rosenthal, MD was a Harvard research ophthalmologist who specialized in treating chronic eye pain. He studied corneal neuropathic pain following LASIK and other forms of laser eye surgery, and submitted his research to peer-reviewed ophthalmology journals for publication; however, his research was rejected despited being vetted by leading scientists. Big Ophthalmology is attempting to stymie this information, and to keep the public in the dark about the widespread problems of LASIK surgery. Although several LASIK-related suicides and countless cases of LASIK-related depression have been documented, LASIK industry representatives have repeatedly denied any link between LASIK complications and depression or suicide. But wait! What did Lt. Cmdr. John B. Cason, M.D. say to a group of his peers in January, 2012? Some patients are so uncomfortable and so despondent over failed treatments that they become suicidal. As one patient Dr. Cason had in fellowship said, "I want my eyes taken out or I want to die." Unnecessary vs Elective Surgery - Read email from a surgeon in another speciality. Letters (Scroll down to 9/24/2011). Physician with LASIK complications e-mails his story to us. Read Dr. Morcos' story (Scroll down to 12/29/2010). Dr. Morris Waxler, former FDA chief of Ophthalmic Surgical Devices Branch, filed a citizen petition with the FDA calling for withdrawal of FDA approval for all LASIK devices and issuance of a Public Health Advisory in an effort to stop the epidemic of permanent eye injury. Go to our LASIK PETITION web page. (You may also view a pdf of the LASIK petition). 7/7/2011: Read FDA's interim response to the petition. UPDATE 1/23/2015: Read FDA's interim response to request for reconsideration of the LASIK petition. Color photographs and topographies of post-surgical eyes: Post-LASIK Ectasia, Corneal Transplant, Radial Keratotomy (RK), LASIK Flap Complications, Post-LASIK Epithelial Ingrowth, Case Reports, ALK - Automated Lamellar Keratoplasty. Watch stories of LASIK disasters. See television news reports of problems with LASIK. Listen to the warnings of patients who deeply regret having LASIK. From the report: "In [FDA] studies, ~15% of patients experienced night vision symptoms that were worse or significantly worse than preoperative night vision symptoms. Approximately 20% of patients experienced dryness symptoms that were worse or significantly worse than preoperative dryness." View complication table from report. Source: Bailey MD, Zadnik K. Outcomes of LASIK for myopia with FDA-approved lasers. Cornea. 2007 Apr;26(3):246-54. Future Shock: the long term consequences of refractive surgery. (What they knew as far back as 1997). If you did not receive a copy of your LASIK medical records, print this form and have it completed by your LASIK surgeon. In some states medical records may be destroyed after five years. Can you trust this man with your vision? Why would military eye surgeons be intensely interested in the advancement of laser eye surgery? We set out to learn the truth about the relationship between the Department of Defense and the ophthalmology medical-industrial complex. What about newer LASIK technology? Heed this patient's warnings. Even with newer technolgies, such as blade-free LASIK and custom LASIK, persistent dry eyes and night vision problems still occur frequently after LASIK. The latest FDA-required clinical trials confirm this. Several professional golfers have reportedly experienced complica-tions such as night vision problems, chronic dry eyes, or deteriorating vision after LASIK including Kenny Perry, Retief Goosen, Kevin Na, Paul Stankowski, Ian Leggatt, Vijay Singh, John Jacobs, Paul Parajeckas, Peter Lonard, Padraig Harrington, Scott Hoch and Tiger Woods. "To put it more simply, the corneal flap after LASIK provides no more corneal strength than the wearing of a contact lens." William Jory, MD. J Refract Surg. 2004 May-Jun;20(3):286. "I am a physician... I was evaluated and felt to be a good candidate for LASIK surgery... I am now being evaluated for corneal transplant in both eyes... I believe LASIK should be withdrawn." Report filed with FDA. "The biggest regret of my life is not finding your site before having this horrible procedure done." Email from a physician. "Who in their right mind would want to undergo LASIK after viewing these photos?" Email from an eye doctor. 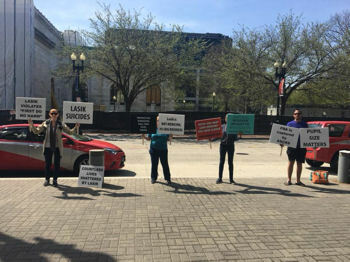 April, 2018: Protest at meeting of the American Society of Cataract & Refractive Surgery (ASCRS) in Washington DC. Injured patient-protesters were met with sneers and verbal attacks from LASIK surgeons. Learn about LASIK-related suicides here. Update 12/21/2018: Tragically, we have recently learned of several more laser eye surgery-related sucides. Today the known suicide count stands at 23 (many more suspected). Watch Dutch filmmakers expose hidden risks of LASIK (with English subtitles). Learn more about suicide after Lasik and how Lasik surgeons are trying to hide the link between a bad outcome from Lasik and depression or suicide. LASIK surgeons say the darndest things when they think the public isn't listening... At the 2016 World Ophthalmology Congress, leading Lasik surgeon, Peter McDonnell, MD, is quoted admitting that Lasik creates a neurotrophic cornea, which they don't know how to prevent or treat. Wouldn't that require that they stop doing Lasik? Afterall, they are bound by the Hippocratic oath to "Do no harm". EXPLOSIVE ARTICLE in October, 2015 issue of Consumers Digest by reporter Catherine Elton. Three former FDA officials are now speaking out against Lasik. Excerpt: "Waxler and Beers say the clinical trials that were used to apply for FDA approval of Lasik devices had flaws that call into question whether the procedure should have been approved from the beginning." Refractive surgeons ‘should’ take ownership of the problems they create. 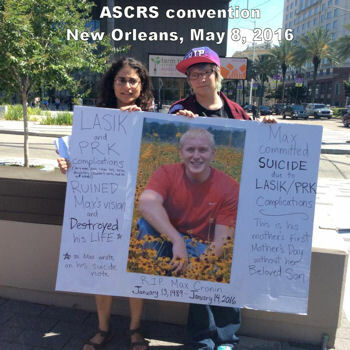 LASIK patient advocates ask the American Academy of Ophthalmology (AAO) and the American Society of Cataract and Refractive Surgery (ASCRS) to earmark foundation funds to assist post-refractive surgery patients who have experienced poor outcomes with the burdensome costs of rehabilitation, including rigid contact lenses, corrective procedures, dry eye treatments, and other costly therapies. Results of the long-awaited LASIK Quality of Life Study have been published on the FDA website. On October 19, 2014, FDA official, Malvina Eydelman, M.D., summarized the study findings saying, "Given the large number of patients undergoing LASIK annually, dissatisfaction and disabling symptoms may occur in a significant number of patients." • Up to 46% of subjects who were symptom-free before LASIK reported visual symptoms (halos, starbursts, glare, and ghosting) after LASIK. • Up to 28% of subjects with no symptoms of dry eyes before LASIK developed dry eye symptoms after LASIK. • Nearly 5% of subjects were dissatisfied with their vision after Lasik. Read more on LasikNewsWire. Important message for PROWL study participants. Lasers can certainly remove corneal tissue, but no technology can replace it. Dr. Edward Boshnick, OD, is an optometrist in Miami, Florida who has devoted his practice to treating patients who have lost quality vision and ocular comfort due to refractive eye surgery, such as RK, PRK, and LASIK. Dr. Boshnick fits specialty contact lens designs such as scleral lenses. Contact Dr. Boshnick. Pasquali et al performed a survey of physicians who underwent laser eye surgery from 2000 to 2012, which was published in the Journal of Cataract and Refractive Surgery (JCRS). In a colossal failed attempt to spin the survey results in favor of LASIK, JCRS editor Nick Mamalis, MD revealed the following high rates of post-surgical adverse effects reported by physician-respondents: "eyes feeling irritated (50%), glare (43%), halos (41%), and [trouble] seeing in dim light (35.2%). "Source: Mamalis N. Laser vision correction among physicians: "the proof of the pudding is in the eating". J Cataract Refract Surg. 2014 Mar;40(3):343-4. In the editorial, Mamalis refers to the LASIK industry's hastily thrown together LASIK WORLD LITERATURE REVIEW, calling it "an exhaustive review". In their haste to counter negative press surrounding a 2008 FDA hearing on LASIK problems, perhaps the authors forgot to mention that the articles retained in the literature review confirm double-digit rates of persistent dry eyes and night vision problems after LASIK. LASIK: A Fight FDA Can’t Ethically Win written by FDA watchdog/blogger. Although LASIK is not mentioned in this video, Holcomb's vision problems started after LASIK surgery, according to Holcomb's book. LASIK surgeons routinely misdiagnose post-LASIK ectasia as "keratoconus" in an effort to keep a lid on this growing epidemic. (Note: The corrective procedures that Holcomb underwent were not FDA-approved for post-LASIK eyes). Excerpt from Holcomb's book: "I had worn contacts and glasses for years and thought nothing of it... A local eye surgeon came to the U.S. Olympic Training Center in Lake Placid and offered free Lasik procedures... After a quick screening it was determined that I would be a great candidate, and so I took advantage of it... That had been a year ago, and not only was I not seeing better, but my vision kept getting worse." Update: Holcomb was found dead at the age of 37 in his room at the U.S. Olympic Training Center in Lake Placid, New York, on May 6, 2017. Excerpt: "... the FDA‑approved labeling for every laser approved for LASIK includes the risks of dry eye syndrome, which can be severe; the possible need for glasses or contact lenses after surgery; visual symptoms including halos, glare, starbursts, and double vision, which can be debilitating; and the loss of vision. FDA recommends the inclusion of this risk information in all advertising and promotional materials for FDA‑approved lasers used for LASIK." Read FDA Letter to ASCRS 3/20/2012. If you become aware of an advertisement, promotional material, or Internet promotion for LASIK that fails to disclose risks, contraindications, warnings, and precautions, please forward it to the FDA. We have designed a template that you may modify to file your complaint. False ad template. Leave your comments and sign the petition to stop LASIK. Read what over 1,500 current signers have to say. If you are an injured LASIK patient, you should file a MedWatch report with the FDA. Read a sample of LASIK injuries on file with the FDA. You can help spread the word about problems of LASIK. Add a link to this website on your website or blog, or post a link anywhere LASIK is discussed on the Internet. 2/4/2013 - Global News 16x9 reports Daniel Mouflier's LASIK hell. •Scott Hyver Visioncare Inc., of Daly City, Calif.
•Rand Eye Institute, of Deerfield Beach, Fla.
11/30/2012 - Dr. Nicholas Caro charged with embezzlement and mail fraud. 4/7/2012 - Retrospective study finds LASIK is not safe for military personnel. 3/5/2012 - LasikComplications.com featured in The China Post. 1/16/2012 - Morris Waxler, former FDA chief of ophthalmic devices, reported the LASIK-related suicide of 28 year-old Vincent Wat of Las Vegas to the FDA commissioner, Margaret Hamburg, M.D., and the director of the FDA's Center for Devices and Radiological Health, Jeffrey Shuren, M.D., J.D. Read Dr. Waxler's letter. Read more about LASIK and suicide. Watch Parag Majmudar, M.D. 's performance as "Dr. I. M. Suicidal" at a convention of the American Society of Cataract and Refractive Surgery (ASCRS), singing of "pushing the boundaries of ethics". Watch Joe Tye's LASIK video series: The Campaign to Outlaw LASIK, Yellow VWs and LASIK Injuries, What "Perfect Candidate" Really Means, The Economics of Lasik Surgery, Lasik Injury and Lost Productivity, The Truth About Lasik Enhancements, The Complication They Won't Tell You About , Lasik Dry Eye Disease, The Lasik Industry Code of Silence, Integrity Check for Lasik Surgeons. Investigators go undercover to expose lies that LASIK clinic employees and doctors tell prospective patients. Former FDA chief, turned whistleblower, exposes corruption surrounding FDA-approval of LASIK devices. Young mother who suffers from painful, chronic dry eyes after LASIK tells her story. Son of a police officer who could not bear to live with the complications of LASIK tells his father's story. Former FDA official pushes for end to LASIK surgery. On Facebook? 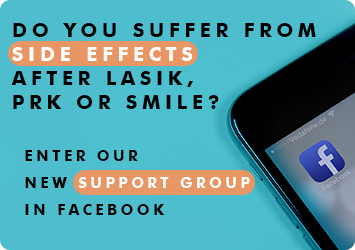 Join the LASIK Complications FaceBook Group. The group seeks to raise awareness of problems and risks of LASIK and other forms of unnecessary refractive eye surgery, and to serve as an advocate on behalf of patients with complications.